There's nothing particularly new about e-petitions, as Tony Blair introduced them to the No 10 website when he was in power. They have however taken on a new dimension in the name of 'democracy', and you can click here to view all of the e-petitions currently underway. The one's that seem to be attracting the most attention, are those concerned with asking for a debate on the subject of the death penalty. 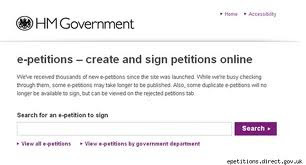 The Government has said that any e-petition that can attract 100,000 signatories will be looked at by a panel of MP's who will decide whether it is appropriate for Parliament to debate the matter. Already we are seeing the mad, the bad and the sad come to the fore. Politicians are lining up to show how wonderfully 'democratic' they are. The Leader of the House of Commons, Sir George Young has said that "it would damage democracy to ignore strong opinions among members of the public, or pretend that their views do not exist". Douglas Carswell MP, said, "The mistake MPs have made is to not trust the people and to try and ignore their concerns". This is all lovely and cosy isn't it? A new era when Politicians vote the way that popular opinion demands. Come on, pull the other one. The UK population currently stands at about 62.3 million, with around 13.3 million being children. This leaves a total of about 49 million adults. An e-petition of 100,000 signatures to trigger a debate is supposed to be democracy at work, but this is 0.002% of the adult population. Supporters of the death penalty often point to public opinion polls showing that over half the population are in favour of the death penalty. I'm not a lover of opinion polls, even though they state that their accuracy rate is + or- 3%. Take this question. "Are you in favour of the death penalty for murder, even if on a very rare occasion a mistake is made?" Many would say yes. Change the question slightly to this. "Are you in favour of the death penalty even if you were one of the mistakes being made?". I suggest that the response would be somewhat different. A lot of press attention is being given to the e-petition created by Paul Staines, who writes the Guido Fawkes polital blog, and who campaigns for the re-introduction of the death penalty for certain murders. To date, this has achieved 21,434 signatures, and as he apparently has about 60,000 people who read his blog, he may well achieve the required 100,000. What is rarely being mentioned is the e-petition created by Martin Shapland who wants the Government to retain the ban on capital punishment. To date this has 29,787 signatures. I've no doubt that there will be a debate, but is it all a waste of time? Will it just be Parliament going through the motions? Even if they voted to re-introduce the death penalty (which won't happen), nothing will become law. Why? Because of the Lisbon Treaty that the UK is signed up to. The treaty's Charter of Fundamental Rights, Title 1, Article 2, section 2 says, "No one shall be condemned to the death penalty, or executed". As Mary Ellen Synon of the Daily Mail says, "That overrides anything Parliament may decide". Paul Staines recognises this, for in his petition he says, "We petition the Government to review all treaties and international commitments which may inhibit the ability of Parliament to restore capital punishment". Whatever your views on the Lisbon Treaty, (and I have huge problems with its dictatorship) withdrawing from it will not happen. That's why I say a debate on the matter is a waste of time and money. Those calling for the re-introduction of the death penalty for murder are not agreed on the type of murder that will trigger execution. Some want to see it introduced for all murders, while others are talking about for specific murders. Paul Staines in his e-petition is asking Government to "restore the death penalty for the murder of children and police officers when killed in the line of duty". Why just these? Is the life of a police officer less valuable and precious, if it is snuffed out when he is murdered off-duty? Is the life of an elderly person who is brutally murdered in their own home of less importance? Why are these value judgements made? The last executions in the United Kingdom took place in 1964. The death penalty was formally abolished in Britain in 1965, and in Northern Ireland in 1973, and I for one would like it to remain abolished. Let me make it clear, I am opposed to the re-introduction of the death penalty, and have signed the e-petition accordingly. I've noticed already that supporters of this position are being called, "bleeding heart liberals" or "bloody do-gooders", plus other names that I prefer not to repeat. Why is it that instead of being able to have a healthy debate on a subject, the response of many is to engage in vitriol against someone with an opposing view. Tolerant society? Don't make me laugh. There is a view held by many who support the re-introduction of the death penalty, that it acts as a deterrent. This is questionable. Statistics have been shown by supporters, particularly from the United States to prove the deterrent value of the death penalty. However, other statistics from the States can show that one State with the death penalty has a higher murder rate than another State who does not have the death penalty. Statistics can be produced to bolster any polemical argument. Rupa Reddy, from the University of Westminster's Centre for Capital Punishment Studies says, "You can't say that the death penalty has no deterrent effect. But there is no evidence that it is more influential than Life Without Parole sentences and first-class detection techniques". A strong emotional argument put forward by supporters of the death penalty, is the re-offending rate by those who were convicted murderers, who went on to murder again after being released from prison. Some say that this figure is around 200 people since the death penalty was abolished in 1965. They seem to delight in saying that with the death penalty, "the re-offending rate is zero". Yes, the murder rate in England and Wales has risen substantially since 1965, but the country has also changed over these last 45 years. The population has gone up; it is less homogenous, and there are far more lethal weapons in circulation. Pro capital punishment supporters seem to dismiss the mis-carriages of justice that have occured, as either being because they are "very, very few in number", or the price to pay for getting murderers off our streets. I for one do not believe that that price is worth paying. I've read some glibbly saying that with the advances in forensic science, there is little chance of mistakes being made today. How I would love that to be true, but I don't believe it to be so. If the possible death of an innocent man or woman was the only argument I had against capital punishment, it would be enough for me. Even if the numbers are "very, very few"; one is too many. No-one should die for a crime they did not commit. No-one. I strongly recommend that you click here, and read the case of Cameron Todd Willingham. You will need to give time to this, as it is a very detailed analysis covering 17 Internet pages. But this matter of the death penalty is too great not to give time to the issues. Zach Johnstone, in an article looking at the case of Troy Davis, concludes with these words. "... I find myself opposed to the reinstatement of capital punishment: the loss of even one innocent life in the name of retribution is, I believe, too great a price to pay". Let me finish with this. Murder is a heinous crime, and while I support retaining the ban on capital punishment, I also strongly support changes to the criminal justice system, which will have the same effect as capital punishment, of preventing murderers being released from prison only to murder again. I believe that all those convicted of murder should be sentenced to life imprisonment, without the possibility of parole, and that life is life. They will remain in prison (unless subsequently shown to be innocent) until they die. I'm pretty sure that the call to re-instate the death penalty will be defeated, but I'm less sure that the law will be changed to ensure that life, means life. I certainly hope that I'm wrong on this last point.